Vincent Brault married Marie Bourg, daughter of Antoine Bourg and Antoinette Landry, about 1661 in Port Royal, Acadie. Vincent Brot, labourer, age 40; his wife, Marie Bourg, age 26. Their children: Marie, age 9; Antoine, age 5, Marguerite, age 3, Pierre, age 1. 9 cattle and 7 sheep. 4 acres of cultivated land. 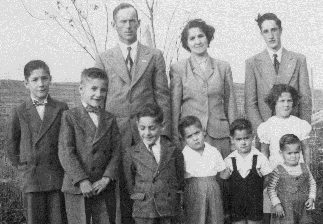 Marie Bourg, widow of Vincent Brault; Children: Antoine, 20, Marguerite, 18, Pierre, 16, Anne 14, François, 12, Jean, 10, Marie-Elizabeth, 9, Jeanne, 6, René, 3, Suzanne, 1. 6 cattle and 4 sheep. The eldest daughter, Marie, was married to Germain Savoie. She had two sons, Germain, 5 and François, 2.